Nathanael Greene is an NSSAR Patriot Ancestor. Nathanael Greene (August 7 [O.S. July 27] 1742 – June 19, 1786, frequently misspelled Nathaniel) was a major general of the Continental Army in the American Revolutionary War. 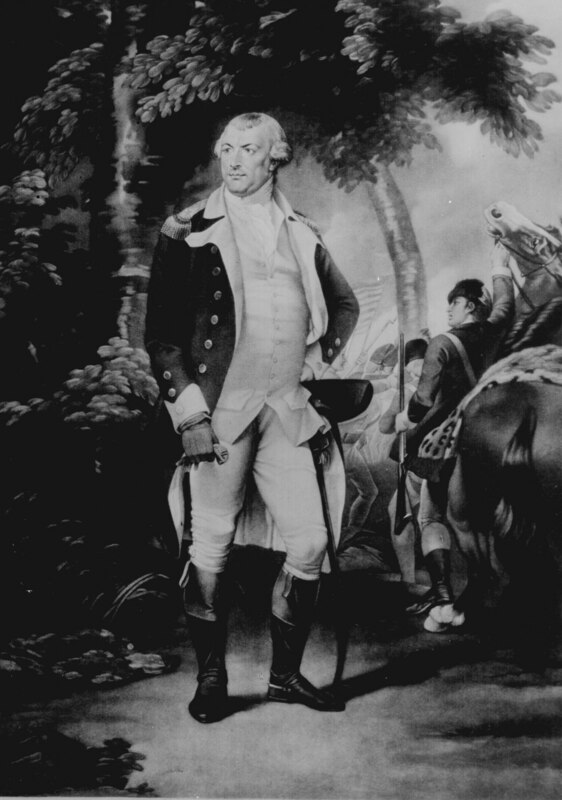 When the war began, Greene was a militia private, the lowest rank possible; he emerged from the war with a reputation as George Washington's most gifted and dependable officer. Many places in the United States are named for him. Greene suffered financial difficulties in the post-war years and died suddenly of sunstroke in 1786. Nathanael was the son of Nathanael Greene (1707–1770), a Quaker farmer and smith, and the great great grandson of John Greene and Samuel Gorton, both of whom were founding settlers of Warwick, Rhode Island. Nathanael was born on Forge Farm at Potowomut in the township of Warwick, Rhode Island, on August 7, 1742 new style. His mother, Mary Motte, was his father's second wife. Though his father's sect discouraged "literary accomplishments," Greene educated himself, with a special study of mathematics and law. The Rev. Ezra Stiles, later president of Yale University, was a strong influence in the young Nathanael's life. In about 1993 we visited the home in which Nathanael was born. This home was then owned by Thomas Greene and his mother Anne Greene. This Thomas Greene is not a lineal descendant of Nathanael's. July 27, 2001 we helped celebrate Nathanael's 259th birthday at "The Forge", Potowomut, East Greenwich, Rhode Island where he was born. He married Catharine Littlefield, also known as "Caty," of Rhode Island. 19 June 1786 Savannah, Chatham, Georgia, USA. Seventeen U.S. states have named counties in Gen. Greene's honor. They are: Alabama, Arkansas, Georgia, Illinois, Indiana, Iowa, Kentucky, Mississippi, Missouri, New York, North Carolina, Ohio, Pennsylvania, South Carolina, Tennessee, Washington, and Wisconsin. Daughters of the American Revolution, DAR Genealogical Research Databases, database online, (http://www.dar.org/ : accessed May 20, 2017), "Record of Nathanael Greene ", Ancestor # A047219. Collections of the Massachusetts Historical Society (Massachusetts Historical Society, 1793) Vol. 2, Page 41-246: "An Historical Journal of the American War"
We used to pose under his huge equestrian statue in the Guilford Courthouse Battlefield Park in Greensboro, NC, not knowing until this year that he was a blood relative on my father's side. The biography of Catharine Littlefield Greene "Caty" by John and Janet Stegeman offers more information on Nathanael Greene's children. These included Martha Washington Greene (who married John C. Nightingale and then Henry Turner), Louisa Ray Greene (who married James Shaw), and Catharine Greene (who died in infancy). Also, Cornelia Lott Greene re-married after the death of Peyton Skipwith, Jr. her cousin Ned Littlefield (son of William Littlefield, Catharine's younger brother). Nathanael is 16 degrees from Amy Gilpin, 14 degrees from Joshua Slocum and 13 degrees from Henry VIII of England on our single family tree. Login to find your connection.